Regardless of what types of activities you enjoy with your family, there is bound to be something you’ll enjoy and that will fit your budget this holiday season in the Greater Atlanta area (and beyond). Below, we’ve compiled one of the most extensive lists out there for family-friendly winter holiday activities! *Drive times are estimated from the center of Smyrna, to the center of hosting cities, not including traffic. Ice Skating (outdoors!) at Centennial Olympic Park, Atlanta– Price: $10/person. Ages: Best for children 4+. Drive time: 30 minutes. Snow Mountain, Stone Mountain– Tube down a mountain of snow, kids can build snowmen and igloos, and roast marshmallows. Price: Starting at $22/person + $10 parking. Advance reservations are required. Ages: All. Drive time: 45 minutes. The Radio City Rockettes Christmas Spectacular, Cobb Energy Center, Atlanta– Live stage show. Shows run November 7th-23rd. Price: Starting at $27/ticket. Ages: Best for children 4+. Drive time: A few minutes. Rudolph The Red-Nosed Reindeer Puppet Show, Center For Puppetry Arts, Atlanta– Live puppet theater performance based on the classic TV special. Price: $9.25- $20.50/person. Ages: 4+. Drive time: 30 minutes. Macy’s Pink Pig, Lenox Square Mall, Atlanta– A classic Atlanta holiday (train) ride since the 1950’s. Price: $3/ride (discounts available for more than one ride). Ages: All. Drive time: 30 minutes. Lowe’s Build and Grow Kids Clinic, Train Engine (multiple locations)– Saturday, December 14th at 10:00am. You must pre-register on the site. Kids can build a festive train engine with rub and smell stickers. Spaces are limited. Find your closest participating Lowe’s on the website. Price: Free. Ages: 3+. Drive time: Varies. Holiday Craft Classes, Michaels, Smyrna (or other locations)– Different weekly crafts including a reindeer ornament, snow globe, felt stockings, and more. Kids club held on Saturdays, times vary. Price: $2/child. Ages: 3+. Drive time: A few minutes. 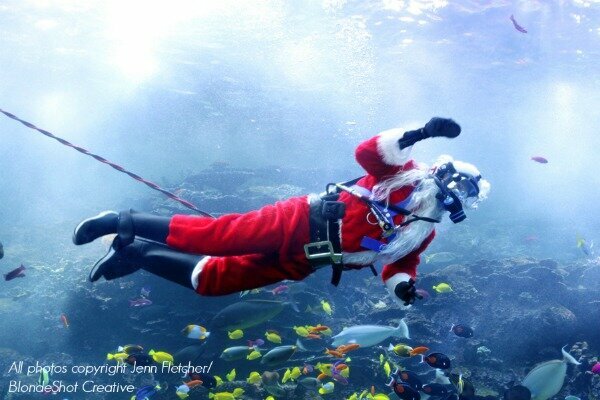 Festival of the SEAson, Georgia Aquarium, Atlanta– Watch Santa scuba diving, watch the Weeki Wachee Mermaids show, see the underwater Menorah, and more. Price: Regular ticket prices, starting at $24/person + parking. Ages: All. Drive time: 30 minutes. Gingerbread House Workshop, Cook’s Warehouse, Brookhaven– Learn to construct and decorate your own gingerbread house together. November 30th, 2:30-5:30pm. Limited spaces, must pre-register. Price: $65 for child/adult pair. Ages: 8+. Drive time: 25 minutes. Reindeer Day, Chattahoochee Nature Center, Roswell– December 15th, 1:00-4:00pm. Live reindeer, crafts, campfire treats, story time, and more. Price: $6-$10. Ages: All. Drive time: 30 minutes. Santa’s Wonderland, Bass Pro Shops, Lawrenceville– Get a free photo taken with Santa, games, kids crafts, and more. Price: Free. Ages: All. Drive time: 50 minutes. Holly Jolly Film Fest, Fernbank Museum, Atlanta– A different classic Christmas children’s film shows each Saturday. Plus, enjoy tree displays, snowflake rubbings, and making your own ornament. Price: Regular museum admission, $15.50-$17.50, 2 and under free. Ages: All. Drive time: 30 minutes. Fantasy in Lights, Callaway Gardens, Pine Mountain– Drive-thru light display, Price: $8.50-$28/person. Ages: All. Drive time: 1 hr., 30 minutes. Magical Nights of Lights at Lake Lanier, Buford– Drive-thru light display, roast marshmallows, rides, live nativity scene, ice-skating, Santa, and more. Price: Start at $60/vehicle. Ages: All. Drive time: 1 hour. Lights of Life, Marietta– Drive-thru light display, petting zoo, train rides, pony rides, live music (weekends), and Santa. Price: Starting at $5/car + a la carte add ons. Ages: All. Drive time: 10 minutes. Atlanta Botanical Gardens, Atlanta– Garden Lights, Holiday Model Train Show, Ride-on Train, meet Santa, and S’mores. Price: $8-$20/person, under 3 are free. Ages: All. Drive time: 30 minutes. 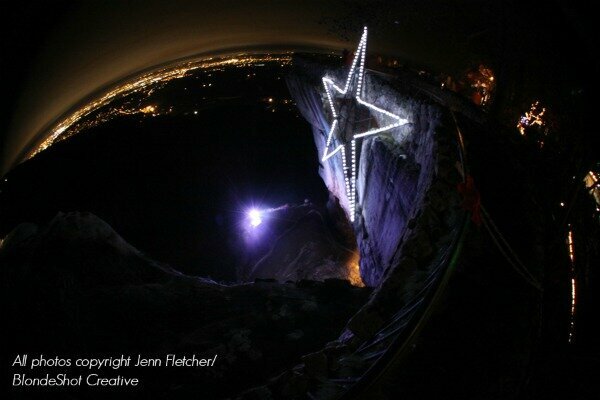 Stone Mountain Christmas, Stone Mountain– Lights, live shows, train ride, nightly parade, fireworks, character meet-and-greets, and more. Price: Starting at $22/person + $10 parking. Ages: All. Drive time: 45 minutes. Holiday in Lights, Centennial Olympic Park, Atlanta Price: Free. Ages: All. Drive time: 30 minutes. Gift of Lights, Atlanta Motor Speedway, Hampton– Drive-thru lights. Price: Starts at $13. Ages: All. Drive time: 1 hour. Global Winter Wonderland, Turner Field, Atlanta– Giant illuminated character and architectural lanterns, carnival games, arts and crafts, live entertainment, and celebrations of holiday traditions from around the world. Price: $17-25, children 4 and under free. Ages: All. Drive time: 30 minutes. Lights at Atlantic Station, Atlanta– Light display, children’s activities, meet Santa, a snow show, and ice-skating. Price: Free + $10-$13 for ice-skating. Ages: All. Drive time: 30 minutes. Christmas Lights at Pettit Creek Farms, Cartersville– Drive-thru light display, live reindeer, hayride, petting zoo, and Santa. Price: $12-$15. Ages: All. Drive time: 1 hour. Lights of The South, Grovetown– Lights, lighted Christmas tree maze, train, hayride, roast marshmallows, and Santa. Price: Starting at $6/person. Ages: All. Drive time: 2 hr., 30 minutes. 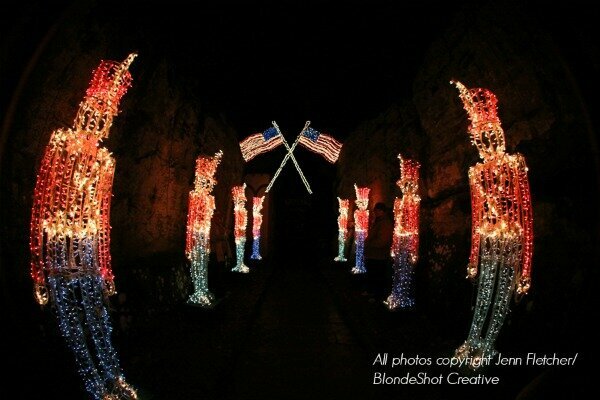 Enchanted Garden of Lights, Rock City, Chattanooga, TN– Walk-thru light display, gingerbread cookie decorating, design a stocking, sugarplum fairy makeovers, live entertainment, meet Santa and other characters, warm fire pits, and optional dinner with Santa add-on. Price: $12-22/person. Children under 3 free. Ages: All. Drive time: 1 hr., 50 minutes. The Polar Express, Great Smokey Mountains Railroad, Bryson City, NC– 1 ¼ hour round trip excursion, warm cocoa and the story, sounds from the motion picture, Christmas carols, and receive a silver sleigh bell from Santa himself. Reservations required. Price: $10-$74 depending on age and date. Ages: All. Drive time: 3 hours. Santa Express or Nighttime Santa Train, Blue Ridge Railway, Blue Ridge, GA– 1 hour or 4 hour (with a 2 hour layover) rides available. Visit with Santa and characters, sing carols, and children receive small gifts/mementos. Reservations required. Price: $22-$46/person. Ages: All. Drive time: 1 hr. 30 minutes. North Pole Limited, Tennessee Valley Railroad, Chattanooga, TN– Train ride, storytelling, meet Santa. Reservations required. 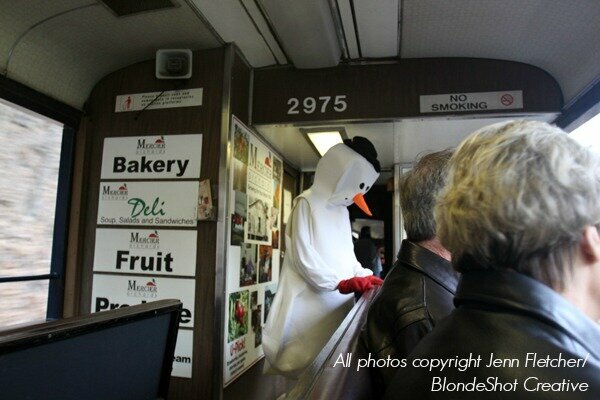 Price: $24/person or upgrade to Santa’s Private Car, $48/person. Ages: All. Drive time: 1 hr., 50 minutes. Coming Home For the Holidays. December 3, 5-9pm. Holiday party and tree lighting at the Smyrna Community Center. Candy Cane Hunt. December 7, 10am – 12pm. Mable House (Mableton). Families will enjoy decorating cookies, roasting marshmallows, working with ginger bread houses and, hunting for 10,000 candy canes. This free event will also include a photo with Santa. Christmas at Brawner Coat Drive. December 20, 5 – 8pm. Taylor Brawner Park. Candy cane hunt, hay ride, pictures with Santa, carnival games, crafts and more. Price of admission: A new or gently used coat (all sizes needed). If those events don’t suit your fancy, there are plenty of other holiday events and activities in the area to participate in. Some of these include breakfast with Santa, parades, tree lightings, Christmas tree farms where you can pick and cut your own tree, other theater performances like The Nutcracker and A Christmas Carol, horse-drawn carriage rides, live nativities, and holiday markets. Pretty much anything you can dream of that is Christmas-related, you can find within a few hours drive!